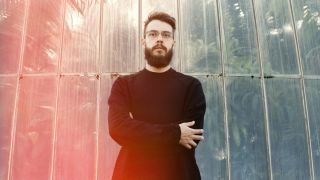 Anyone who thinks that most electronic music betrays a lack of genuine musicianship should take a listen to Ben Hayes. A producer, composer, sound designer and DJ from South London, he’s also an accomplished keys player and doube/electric bassist. Throw in a day job working in Artificial Intelligence, plus software development experience, and the South Londoner has more threats than the assembled Avengers. Given his many and varied talents, it should come as no surprise that Ben draws on a wide range of influences. A trained jazz musician, he’s also kept an ear on the techno, IDM and electronica scenes. Evidence of this multifaceted musical education can be found on See Sun, Hayes’ new EP, which is out today. Released on R&S Records, it demonstrates that jazz and electronic music can make for warm and soothing bedfellows. We asked Ben to discuss how his jazz training has informed his music production career. “At the climax of a solo, when every tiny hair in the room is standing on end, and the air is cracking with anticipatory electricity, when the drummer is at the limit of their physical capabilities, and every person in the room is hanging on each phrase the soloist plays like they’ll never hear another note again, does anyone care that the sax player squeaks a bit? That the trumpeter splits a note? That the drummer rushes or the piano player adds an extra note to the voicing? “Of course not. At this point the music is about raw expression, not technical perfection. In fact, those imperfections, those split notes and squeaks, can sometimes be the most emotive part of the music. What’s more powerful than a proficient musician so overcome with feeling that they momentarily can’t control it? “When we make electronic music, I often feel like we’re working from the other direction. Rather than trying to constrain emotional energy in a way that allows us to play accurately, we frequently start with something sterile and perfect and gradually humanise it by introducing deliberate idiosyncrasies to bring it to life. “I’ll be the first to admit I tend towards maximalism when I’m writing music. I find myself asking ‘what can I add?’ much more than I ask ‘what can I take away?’. Even less often do I ask ‘what else can this do?’. That last question is especially easy to forget, yet is perhaps the most important and powerful. “Some of the most beautiful, moving, rich, and intricate music in the world is played on one, two or three instruments. It’s a fallacy that creating more sounds is the route to making interesting music. Sure, timbre is a fundamentally important medium for expression in electronic music, but to not fully explore the rhythmic, harmonic and melodic potential of each sound before adding more seems wasteful. “The concept of the ‘grid’ is tricky subject. On the one hand, electronic music owes so much of its history to the prescriptive and rigid sequencers on early drum machines, sequencers and grooveboxes, without which some of the most important musical movements of the last century could not have happened. On the other, however, these limitations hide away a whole world of potential musical expression. “Spending even a short time trying to play with a swing feel in a jazz rhythm section makes it painfully clear that music does not neatly fit into the neat scaffold of the grid, or the friendly subdivisions of western music theory. Groove happens when instruments are not perfectly aligned in time. Where each player feels the beat, where they place their notes in relationship to it, how they space and accent their subdivisions - these are the things that define how listeners feel the groove, and ultimately how they move to the music. “Spending even a short time trying to play with a swing feel in a jazz rhythm section makes it painfully clear that music does not neatly fit into the neat scaffold of the grid, or the friendly subdivisions of western music theory." “The early grid paradigm is woven into the DNA of modern electronic music tools. Even if the option is there to free oneself from the grid, that tiny bit of friction can be enough of a discouragement to prevent exploration of the space around the beat. “One of the most elusive and challenging aspects of music to get right is the emotional backdrop - the indescribable sense of mood and vibe that is always present, but elusive and nebulous. Of course, all aspects of music coalesce in some way to contribute to this, but above all of these, harmony is what defines the colour and emotional palette. “A good jazz musician can fluently and eloquently blend between these colours to create an emotional narrative. The subtlety and nuance in Herbie Hancock’s piano comping on Miles’ legendary ‘64 concert does more than just support the soloist’s lines - it completely sets up the harmonic world they live in. The same solos with different harmony underpinning them would tell a very different story. “The power of harmony is often overlooked in electronic music. I know I’m guilty of sometimes not giving it the attention it deserves. Electronic tools make it so easy to construct music from loops, that long range harmonic movement is not something that naturally enters the equation. “Music is a fascinatingly unique artform, because it exists purely in the passage of time. Unlike a book or a sculpture or a painting, music is a transient experience. It is either happening or it isn’t. Even film doesn’t exist as purely in the passage of time as music does - a frozen frame of a film can be viewed in its own right, and captures some of the essence of the original, but what is a frozen ‘frame’ of music? A single digital sample? A spectral snapshot? “Most electronic musicians writing loop-based music have probably felt like they’ve gotten as close as it’s possible to get to a frozen moment of static music, becoming caught in a single loop, augmenting it additively, unable to break free. “Jazz musicians don’t engage with music vertically like this. Improvisation is forward-looking, a collective construction of a narrative. It employs momentum and expectation and is endlessly exciting because of it.“A good jazz musician knows where they want to go next, and uses that to shape what they play now. They manipulate an audience’s anticipation by setting things up, being surprising, building and releasing tension. This is all possible because they embrace music’s temporality. Ben Hayes plays The Waiting Room in London on 30 May.